We’re launching a new series from The Voices Project. This initiative aims to share stories of marginalized and vulnerable groups of people, people created in the image of God. Our hope is that these stories humanize and connect us to others who are different that us (although, not as different as we think) and moves us towards closing the distance between one another. This first post comes from a friend and former pastor of mine. I’ve known Tim for years and know his heart is for those who are near to the heart of God. Take a few minutes and open your heart to what he has discovered in his work with refugees from around the world. If, after reading this, you want to support Tim and his work, you can find suggestions at the end of this post with easy instructions on how you can help. My colleague and I were walking along the rough paths that wind through the Dzaleka Refugee Camp about an hour or so from Lilongwe, Malawi. As we were in quiet conversation, we heard someone behind us clear their throat. We slowly turned around to see a dirty faced little girl with a huge grin on her face. With a confident and strong voice, she began to sing, “Welcome, Welcome. Ladies and Gentlemen…I love you, and Praise the Lord. Welcome”. Then with a loud giggle, she ran off as quick as she had appeared. Her smile and laughter grabbed me. But what I couldn’t shake were her words. ”Welcome, Welcome”. As she welcomed us into her world with open arms, I was acutely aware that the majority of the world was saying just the opposite to her. Our giggling friend is one of 65.3 million people in our world today who finds themselves displaced due to war, violence, conflict, and political or religious persecution. 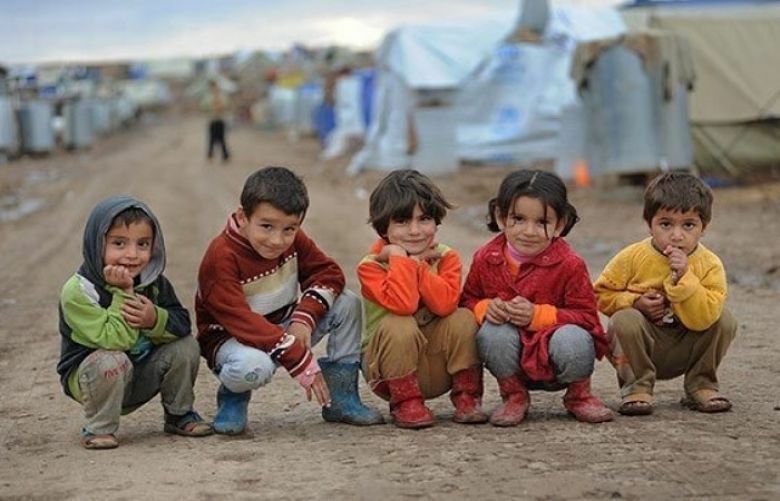 And more than 50% of those displaced, are under the age of 18. In fact, nearly 100,000 refugee teens and children showed up in Europe last year on their own, without a parent or guardian. As we experience the greatest movement of people across our world, numbers not seen since the end of World II, many of our politicians, leaders, and media work to spread fear through misleading and skewed information about refugees. Unfortunately, there are many in the church who are following the same path. Having engaged displaced people in the refugee camps in Africa, along some of the paths that are being traveled in Europe, and with those who have been resettled to North America, I would like to share with you three things that I am learning about God, Refugees, and the Church…and that also give me hope. The first thing I am learning is that God loves and cares for refugees. Deuteronomy 10:18,19 (NIV) says, “He (God) defends the cause of the fatherless and the widow, and loves the foreigner residing among you, giving them food and clothing. And you are to love those who are foreigners…”. Now, if this was a one-off verse, we might be tempted to move on. But over and over throughout scripture, we find that God has a special heart for those who are the most vulnerable, including those whom we see as “foreigners”. If you look closely, you will notice that the whole Biblical narrative is full of displacement; starting with Genesis where Adam and Eve are displaced from the Garden because of their sin, to Revelation, which is written by John, while exiled (displaced) on the island of Patmos. Think of Hagar, Joseph, Daniel, David, Nehemiah, Philip, Pricilla and Aquila, to name a few. In fact, Jesus was a refugee. He and his parents had to flee to Egypt in the middle of the night to escape Herod’s quest to kill him. Over and over we find stories in scripture of God working in specials ways among people who were displaced. And He is doing it today because he loves and cares for refugees. Secondly, I am learning that refugees are more than just people in need. Contrary to what is often portrayed in the media, refugees are some of the most resilient and resourceful people that I have ever met. Don’t get me wrong. They often find themselves in very desperate situations but we often forget that many refugees come with a background in education, business, law, government, medicine, and have other professional skills. My organization, International Association For Refugees (IAFR) works closely with refugee churches that have started in refugee camps in Africa. In spite of the hardships and vulnerabilities that come with refugee camp life, these churches have chosen to tithe on their meager UN rations. Through this sacrificial gift they have committed to serve the widows and the orphans, started pre-schools, Bible and ministry training schools, and sustainable agriculture projects. They have helped to care for the poor and have planted numerous churches both inside and outside the camp. In spite of their need, they have chosen to be missional to the core. Third, and finally, I am learning that the church can be a source of hope in the middle of this crisis. All across the world, local expressions of faith are strategically located near where refugees are on the move. And as the body of Christ, are we not to be the vessel through which the heart of God engages the world and brings hope? Many humanitarian organizations are doing fantastic work, meeting the crisis needs of security, food, shelter, water, and medical care. But for refugees to recover and find hope in their displacement, they need more. They need community, relationship, understanding, increased capacity, a sense of meaning in the middle of their crisis. They need the church to show up and be the church. Here is one example of how a church of about 300 in the Minneapolis area showed up. When the need was made known that refugee church leaders were asking for Bibles, the church raised money to provide several hundred Bibles to the refugee church in the camp. Later the Minneapolis pastor went with us to visit the camp. He was able to encourage and minister to the refugee pastors, as he also was ministered to by them. Another need that was expressed was the desire to hold an annual retreat for the youth in the camp. The youth of the Minneapolis church raised money to make it happen and for the past 3 years, the church has also sent their youth pastor and another volunteer to help run the retreat with the refugee youth leaders. The church has raised money to help put up shelters for refugees and are looking at other projects as well as staying in touch with the churches in the camp through regular visits. The Minneapolis church decided they could also receive refugee families that were scheduled to be resettled to Minneapolis. They have received two families and will be receiving a third family in just a few weeks. Their involvement with refugees has transformed their church. 1. Get Informed about the refugee situation. A couple places to receive a different perspective are www.IAFR.org/toolbox or www.wewelcomerefugees.com. 2. Don’t underestimate Prayer. When I tell the refugees about those who are praying for them, they are so encouraged. It reminds them that they are not forgotten. 3. Consider giving to a group or organization that is doing work among refugees or to a project that will benefit refugees. 4. Look around and see if there are refugees that have been resettled in your area. Welcome them. Show them respect. Invite them into your world. Help them understand and acclimate to your area. 5. Consider showing up in a refugee camp or along the paths that refugees are traveling. Jesus said not only to invite people in but to also go and show up where they are. Tim Barnes serves as the Executive Vice President at International Association For Refugees (IAFR) and also oversees their work in Malawi. He can be contacted at tim@iafr.org. We would love to share your stories. If you have a powerful story of marginalized living and you are willing to let us share it, we would be honored to share those stories. You can email us at cschaffner@fringeconversations.com.